Paper HeARTIST: Have you heard? Maybe you head, maybe you haven't, but Close To My Heart just announced the release of a new Cricut Collection, called "Artiste"! Just as the first Cricut release, "Art Philosophy", this cartridge has 700 shapes, including many 3D shapes. This collection has a retail value of nearly $125. It includes the cartridge of course, as well as three My Acrylix D-size stamp sets and three coordinating 12x9 Dimensional Elements Sheets (Awards, Quotes, and Album Pages). Did you know that you can get this collection for as little as $49.50? Simply host your own Home or Online Gathering with sales of $250 and you can have the collection for this incredible price, plus another $40 in other select CTMH product! Or Pre-order now! 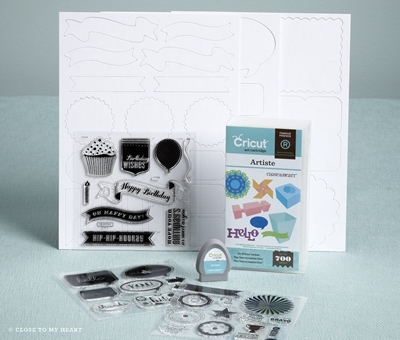 How would you like to get the Cricut "Artiste" Collection for FREE? Follow me on Twitter and Facebook (1 entry per site). Sign up for my newsletter (1 entry). Make an online purchase from my website. (1 for every $20). Check out the current promotion for additional perks on the Promo tab at top of page for more info. Get three additional entries if you add a donation to Operation Smile. Join me for my Semi-Annual Open House/Idea Book Reveal Party on Sunday, July 29th anytime between 2 and 5 p.m. to take advantage of all the other ways to enter. Join my team and receive 10 entries. What if you can't wait until the end of the giveaway to get your own Artiste Collection? Either pre-order one (in July) or purchase one through my website (in August) and if you win, I'll offer you select product worth $99. If you have any questions, be sure to let me know. August's Stamp of the Month..."Baroque Borders"
Become a CTMH Consultant for only $49! "Perfect Pairs" All Month Long!